One of the less-known facts about Abu Dhabi is the abundant and rich cultures from South and Southeast Asian countries like Philippines, Pakistan, Bangalore, Sri Lanka, and, one of my favorite, India! Besides authenticity, one of the best parts is how much more affordable it is compared to say Europe or Toronto, where you'd pay much more for the exotic experience. I went to the Christmas dinner last December (organized by the Canadian Business Council) fashioning a $40 salwar - that's a typical South Indian dress. Upon hearing this, one of my Indian colleagues was only too happy to drag me to her home and lend me a deck of tikkas to accessorize - that's the twinkling bits between my eye brows. I love how pretty and festive it turned out! 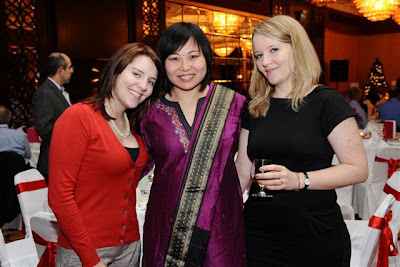 Here is a photo of Hallie (left), Meg (right) and I from the event. Great fun! Of course Indian food is another favorite part. Indian Thali is, essentially, the equivalent of Japanese bento box: a collection of small servings of soup, salad, curry, sweets surrounding bread and papadum (that's a crunchy wafer-thin fried bread slice!) served in a big metal plate. Soooo amazigly delicious, all for $4! Chhappan Bhog and Anjappar are two of the best Indian eateries within walking distance from our home and my work place - which makes me a regular naturally and the friendly staffs at Anjappar would only be too happy to offer me an extra papadum! 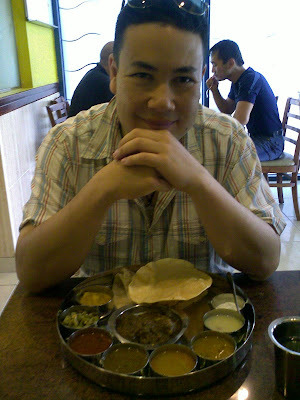 :) Here is a photo of Q presenting the thali meal with a content foodie's smile. We <3 it walking like an Indian!